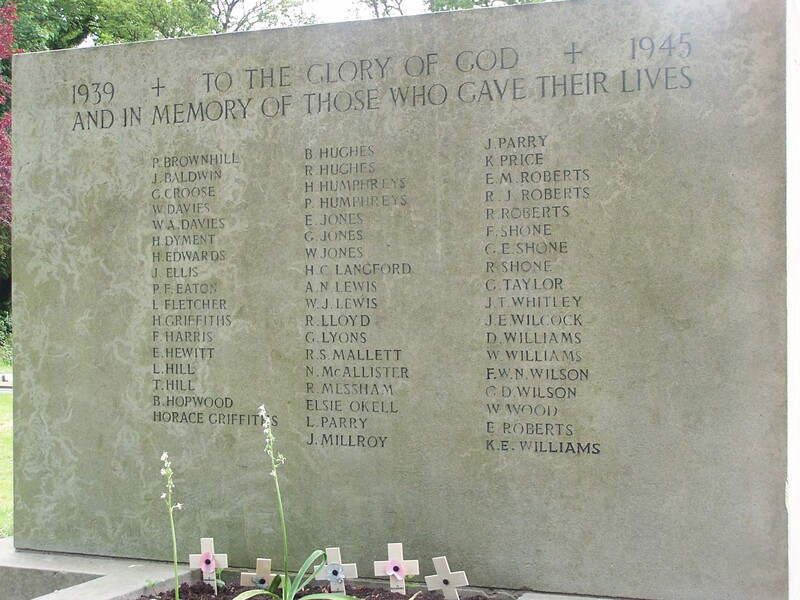 There are 52 men and one woman named on the Hawkesbury Memorial. Most of them have been identified in the list below. Links are provided to some stories told in more detail. Fusilier Jonathon Baldwin, 4197761, Royal Welch Fusiliers, 8th Bn., killed by lightning, 9 June 1940, Bistre Emmanuel Churchyard grave 409, son of Samuel and Adelaide Baldwin of Stanley Road. Gunner William Davies, 4190907, Royal Artillery, 22 January 1942, 25, son of William and Elizabeth Davies, and husband of Kate A. Davies of Leeds, Alamein Memorial. Ordinary Seaman Frederick William Harris, D/JX239116, Royal Navy, HMS Edinburgh, 2 May 1942, 22, son of William F. Harris and Sarah J.W. Powell of Liverpool, Plymouth Naval Memorial. Robert Lloyd – believed to be Robert Lloyd, 27, buried 5 August 1942 at St Matthews, son of Robert and Dorothy of Argoed and husband of Norah (nee Kelly) of Ewloe Place. Robert worked for 8 years for Messrs. John Summers, Shotton. He was a flight mechanic in the RAF and his funeral cortege at St. Matthew’s was headed by a contingent of Mynydd Isa Home Guards. Marine Gerald Lyons, PLY/X 2469, Royal Marines, 21 June, 1943, 24, Son of Patrick and Edith Lyons (nee Shaw), of Park Road, Buckley, Bistre Emmanuel Churchyard grave 277. Died in hospital at Kilmacolm, Renfrewshire while assigned to H.M.S. Illustrious. Remembered by his nephew here. Radio Officer Ronald Stroud Mallett, British Overseas Airways Corporation, 26 September, 1942, Runnymede Memorial. Son of Beatrice Mary Stroud of Cartref, Mynydd Isa. Trooper George Davis Wilson, Life Guards, 11 April 1946, 24, son of Thomas & Bessie Wilson of Lyme Grove, husband of Mary Bridgett (nee Ellis) of County Wicklow, Ireland, Brookwood Memorial. George died following an operation in the University College Hospital, London. He saw active service in Persia, Middle East, Italy France & Germany. He was only married about 4 months ago before he died. Serjeant William Wood, 3rd Bn. Welsh Guards, 9 May 1943, 26, son of William and Florence Ellen (nee Palmer) Wood of Bryn-y-Baal, husband of Edna Mae Wood of Rochdale, Massicault War Cemetery, Tunisia. Prior to joining for active service he was a member of the Rochdale Borough Police Force. Also named on the Mold Memorial. Able Seaman Kenneth Eric Williams, C/JX 253629, Royal Navy, HMS President III, 11 September, 1941, 26, Son of Walter and Jane Ann Williams; husband of Frances Williams, of Buckley, Flintshire, Chatham Naval Memorial.